Snowman is an entry I originally made in just one week for the "Homebrew platforming competition" two years ago. Now I participate again for the "Alive and Kicking Coding Competition" with new enemies, new levels, improved engine and c4a support! 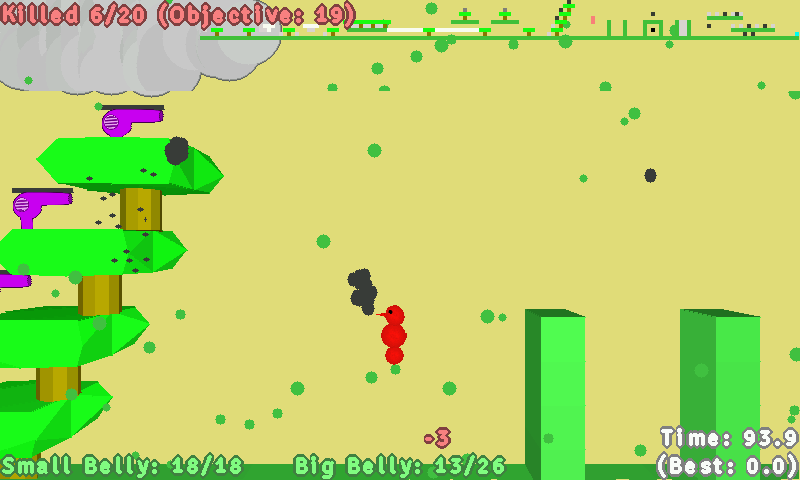 It is an 2D jump and run with 3D graphics totally rendered with the cpu. In Snowman you are a snowman with the task to kill a given number of enemies per level to unlock the next level. If you collect snow you grow, but nearly every action you do let's you loose snow again like jumping (1 snow), shooting (2 snow) or getting hit by an enemy (3 snow). So you have to economize your snow. Try to solve levels as fast as possible to get a better score in c4a! Change for version 2.0.0.4: Fixed a little bug, that my crashed the whole game at level change. Maybe the bug CCF mentioned? However, thanks to Foxblock for his great reproducible bugreport! Change for version 2.0.0.5: Higher timeout (15s instead of 10s) as people have problems commiting the c4a scores. I hope this helps. Change for version 2.0.0.6: Cooler music change + no music break at loading c4a scores. Change for version 2.0.0.7: Fixed an error in the map for hard mode. Furthermore add a "Try again" entry if the c4a submit fails. Change for version 2.0.0.8: Fixed an error since version 2.0.0.7, which broke the hard mode. Change for version 2.0.0.14: I can count to potato! Change for version 2.0.0.15: Changeable button mapping. Just edit the controls.cfg in the appdata folder. Change for version 2.0.0.16: Control mapping changeable ingame. I keep coming back to this, even when it isn't what I want to play. @CCF: Thanks, but in fact I just added a participation-hint, as required by the competition rules. So your bug should be still in there. Could you give me a more completely bug report to zizsdl_at_googlemail.com? From time to time I am online in IRC (freenode and efnet), too. @Ziz..don't know what you did but better now....5/5! !